After picking up a great lunch at Corolla Village BBQ, we arrived in the beautiful Ocean Hill area of Corolla just before noon and pulled into the driveway of Gift From The Sea. 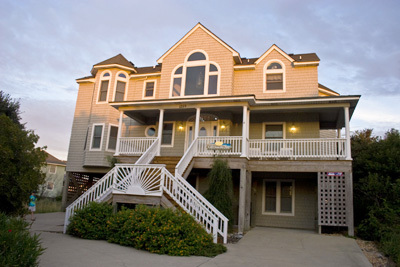 This is one beautiful beach house and we were blown away when we went in to take a tour of the new place. It was big and bright and open and had a great view of the ocean from all of the decks. We all picked our rooms and unpacked before sitting down for lunch. We took the short walk to the beach and set up camp for the day. The weather was warm, if a bit windy and the red flags were up as Tropical Storm Danny kicked up the surf as he passed by. The kids ran around the beach and found many shells worthy of collecting on the beach. We got in the water, but never more than knee deep due to the red flags flying. The beach patrol was on high alert and passed us on ATV’s every 10-15 minutes. They really do an excellent job of protecting the people on the beach and informing people of the dangers of rip-tides. The next two days were beautiful and the red flags came down. We rode many, many waves with the boogie boards and spent all day on the beach. It was less crowded than the previous week and there was plenty of room to spread out and relax. There was a sea turtle nest roped off in the sand near our beach access. We kept hoping we would be lucky enough to see them hatch, but, no such luck. We did see volunteers there from time to time, tending he nest and talking to curious vacationers. Ocean Hill is full of wildlife and we saw several deer, rabbits, a multitude of butterflies and sea birds galore. We flew kites from the deck and grilled out several times on the gas grill on the deck. After the kids were in bed the adults played a few board game, including scrabble. You know you have a competitive group when arguments break out over scrabble. Good times! We ran into a few rainy days the second week and had to find other things to do besides the beach. We went to the Corolla Nature Center, and looked around for a couple of hours. It is a neat place and we will definitely go back again. Lots of history on the Corolla area and a huge collection of waterfowl decoys of all kinds. Later that afternoon, we tried out the giant hot tub on the deck facing the ocean and enjoyed the sound of the waves and the salt air. When the rain broke, we went crabbing near the Whalehead club. All you need to catch blue crabs from the sound is a raw chicken neck, a length of string, a long-handled net and a five gallon bucket. Jill, the kids and I had a blast catching dozens of blue crabs ranging from small to large. We are a catch and release operation, so all of the crabs were returned safely to the water after being admired by the kids. Jack was a little too brave and got a good pinch while showing off for his brother and sister. Funny stuff. Jim and Elaine (Jill’s parents) had to leave us on Wednesday for the long trip back to central Florida. The weather was spotty the rest of the week and we took lots of walks and spent time bonding as a family. We had a break in the clouds Friday and spent much of the day enjoying the beach with other vacationers. It was a great way to end our last week. Saturday, I woke up and watched the final sunrise of my vacation before packing up the Tahoe for the drive back to Richmond. It was a melancholy morning for all of us as we said goodbye to the house and left the Outer Banks for home. The gloomy feeling soon passed as we all discussed our favorite parts of the trip and what we were going to do next time. We all made memories to last a lifetime and had the pleasure of spending two weeks together without any of the usual distractions you have at home. That’s what a vacation is all about and this was a great one!